UPDATE: Shark Week 2018 starts Sunday, July 22 so get ready! It's also the 30th anniversary of Shark Week, so let the Shark Week 2018 countdown begin. We don't have cable and I'm already way more nervous in the ocean than any woman my age should be, so Discovery's Shark Week is not for me. But for so many people, Shark Week is a holiday in itself to be celebrated. A week long TV marathon featuring the ocean's not-so-friendly creatures. To get in on the fun, I was thinking about a Shark Week wedding. It would be great to have it during Shark Week. Then your busiest week of wedding planning would be Shark Week, and you would be able to sit and relax and watch sharks on TV after running around planning all day. Plus, Shark Week actually lends to a lot of ideas (some of which are really cute). 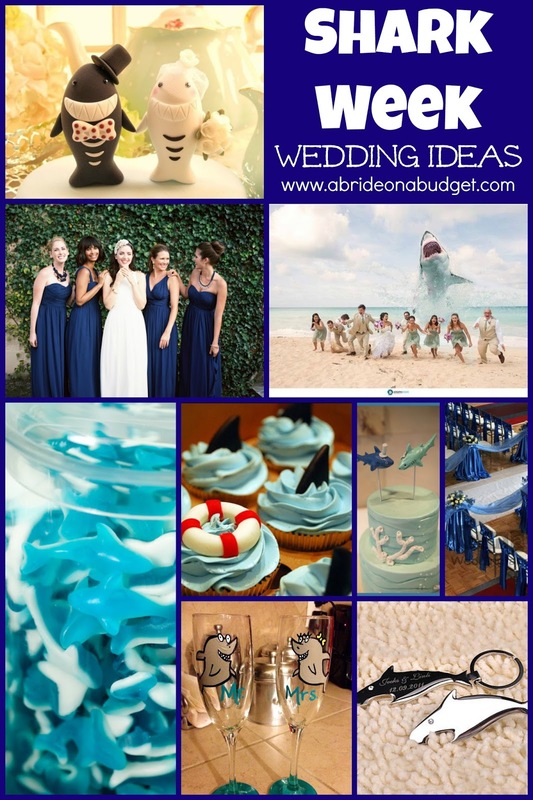 For a Shark Week-themed wedding, you're going to want to focus on blues for your decor. Personally, I would go with a navy and add in pops of a lighter blue. 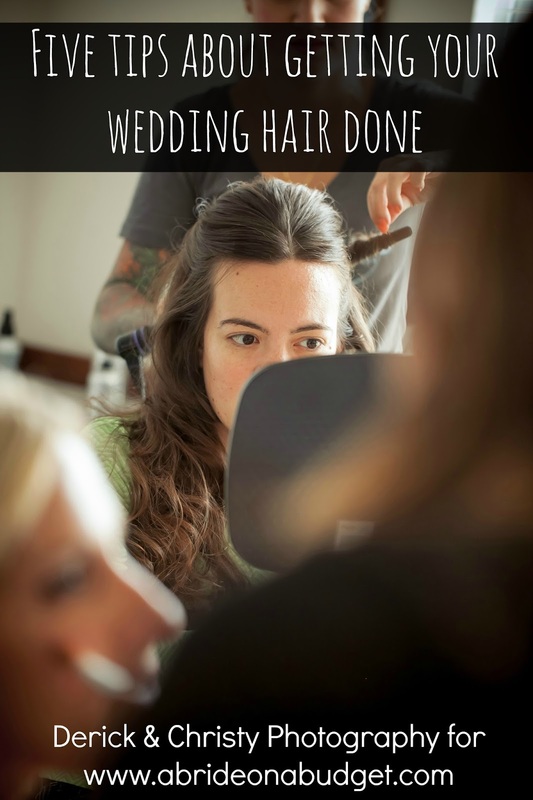 It lends to really great wedding photos (and, after all, it is a wedding). I would absolutely put the bridesmaids in navy as well. Have the groomsmen match with navy vests and ties and in a gray tux because, come on, this is Shark Week. You have to have them in shark gray. If not, that's a big missed opportunity. I would keep flowers really simple and go with baby's breath bouquets for the bridesmaids. Gypsophila bouquets are really popular right now -- and budget friendly. Plus, you can say the white represents a shark's white teeth (that and I think any other color would really take away from the theme). And red would just be terrible. During the reception, you'll have a ton of places that you can add in a pop of shark, but you really don't want to go overboard (What a terrible -- and unintentional -- pun that was). If you do, you'll look like you're throwing more of a birthday party than a wedding. 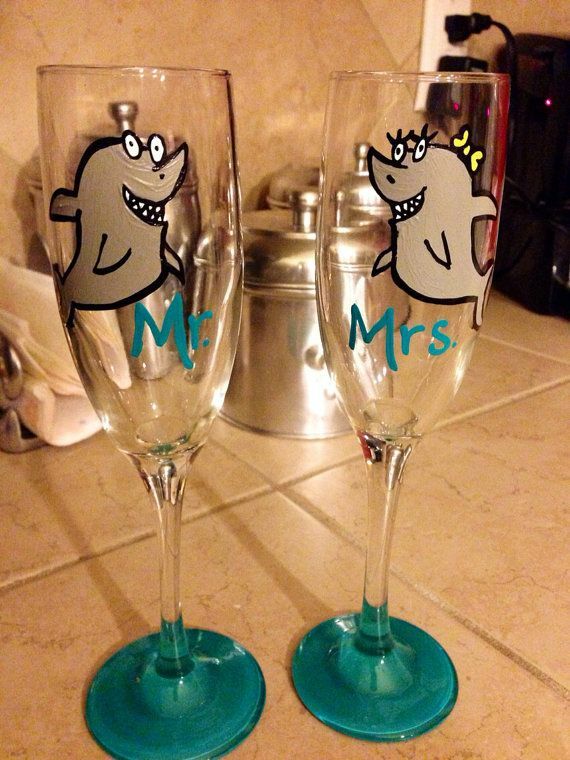 But there's no way you can have a Shark Week-themed wedding without those painted toasting flutes. They're really cute and are a nice keepsake for the future. See, most of your Shark Week wedding decor will get tossed or lost, but you will definitely keep these -- and use them during Shark Weeks to come. I absolutely think you need shark cake toppers too. Personally, I think wedding cake toppers are a place to shine. They're really a great opportunity to tie your wedding theme into your cake. Plus, if you have a really cute topper, you can have simpler cake decorations. And, small aside: Cakes are expensive and elaborate decorations add to that expense. Any intricate and ornate decorations involve a ton of manual labor -- which you will end up paying for. So yes, it would be cute to have waves piped all over your cake with a ton of fondant air bubbles, but you will be paying someone to sit and roll those fondant bubbles, and that labor cost adds up. But if you do decide on it, can be cute. Regular cupcakes with blue-tinted frosting and a chocolate shark fin. Who wouldn't love those? Plus, they're really eye catching, especially since frosting just lends itself to looking like waves. 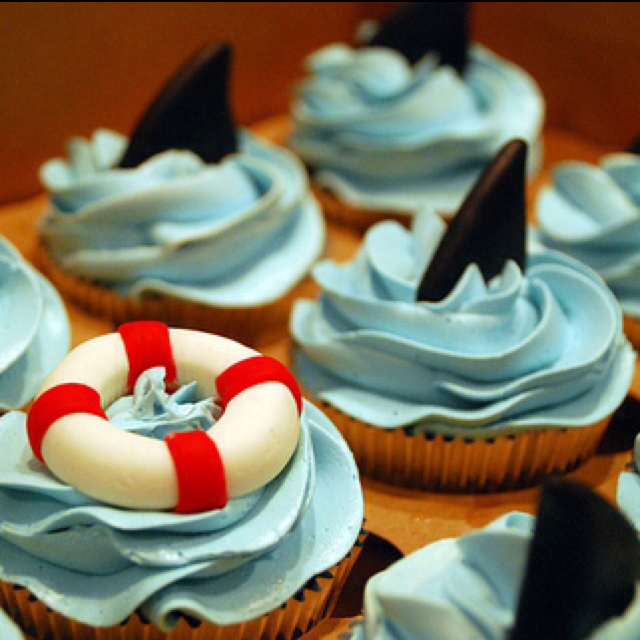 If you want to be simpler, you can dress up plain cupcakes with shark cupcake toppers. Just drop them off with your baker and they'll show up to your Shark Week wedding already decorated. If you're planning on a candy buffet, you're in luck. You can have foil-wrapped candies alongside shark gummies. They're cheap if you buy them in bulk. 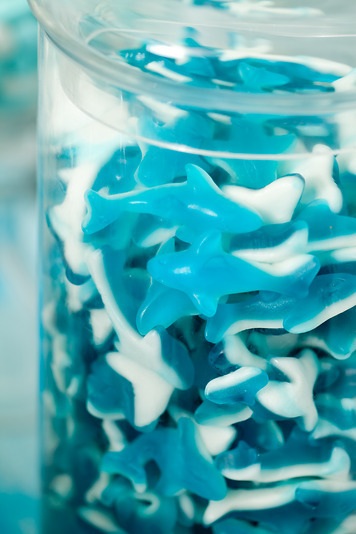 And if you just have a little bucket of sharks mixed in with the other candies, it will make your guests really smile. Plus, it won't be overkill. And favors are easy. Shark bottle openers. 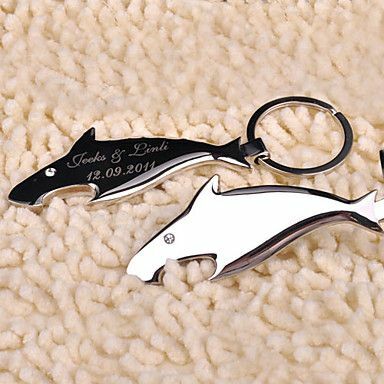 That personalized set above is a little pricey, but I found this shark bottle opener pack on Amazon for a bit less. Seriously, that would be the perfect ending to your perfect Shark Week wedding. And trust me, with this type of theme, invitations are important. You want your guests to immediately know they're invited to a Shark Week wedding. This isn't something you want to spring on them like a shark attack (womp womp womp). 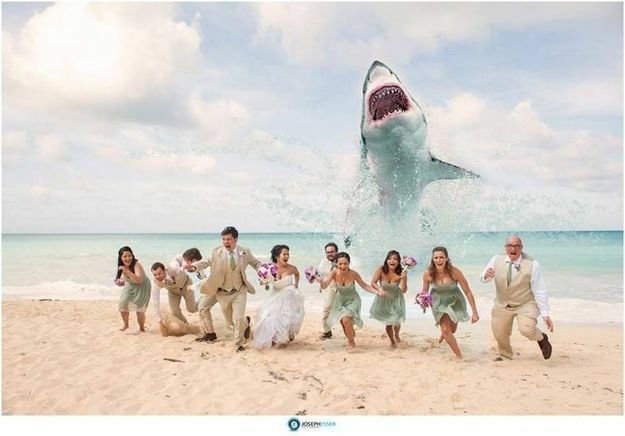 BRIDAL BABBLE: What else would you add to your Shark Week wedding? Such a fun idea! Love the cake toppers, they're so cute and adorable. Thanks for posting. That photo is so original, I haven't seen it until now. 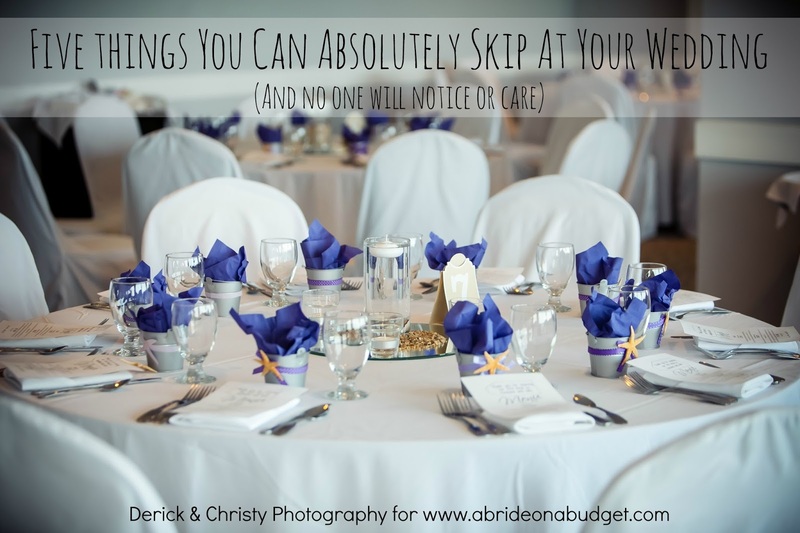 What a fun theme, I'm sure guests will be talking about this one long after the wedding has come and gone. LOL! This is a great idea for a Shark Week fanatic couple! I like all the ideas, the cake toppers and the beach photo the best. Love the Sharknado photo and the shark gummies! I never would have thought of this theme! The bridemaids colors were so pretty. 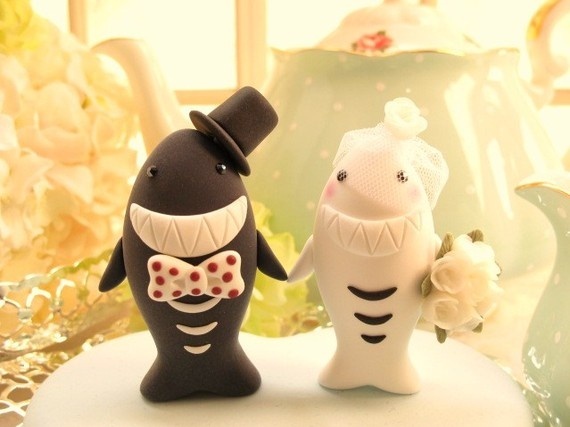 The cake toppers holding hand...cutest little sharks I've seen. But the epic part is the wedding party photo in the sand! Love! That's funny. We don't live anywhere near where sharks are. 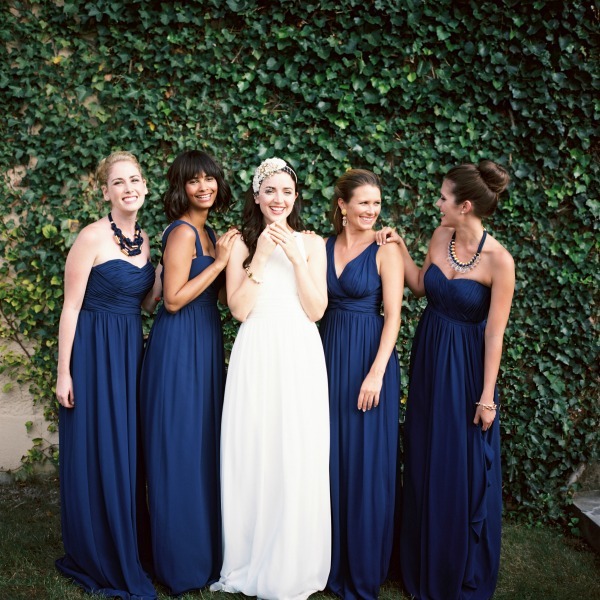 My parents picked midnight blue as their wedding color, similar to the gowns pictured. That brings me back! Please turn those gummy sharks into a Sharknado reference. Oh My gosh. What a very creative idea! I know there are folks out there who would do this too. How fun! At first I just thought this was the strangest idea EVER. Having now read your post and seeing all the interesting things that can be done -- it really IS kinda cool! What a fun a beautiful idea. The colors were awesome. It was extremely creative. I love that last photo!!!! Makes me laugh. I do love the wine glasses. This is actually quite beautiful! I would love this since I have always loved sharks. These are awesome ideas! I love the flutes and cake toppers! There really are great ideas for something like this! Your ringbearer pillow could be a stuffed shark. kristiedonelson(at)gmail(dot)com Thank you. the photos for these cracked me up! The one with the shark coming out of the water is sooo funny! LOVE SHARK WEEK GREAT IDEAS! 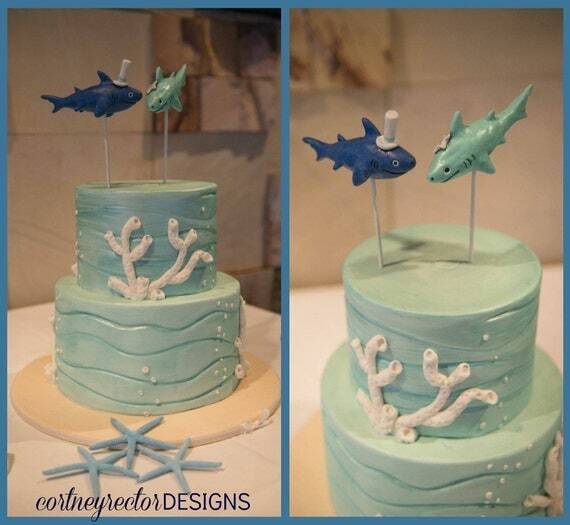 I love the shark cake toppers, also the blue cake. 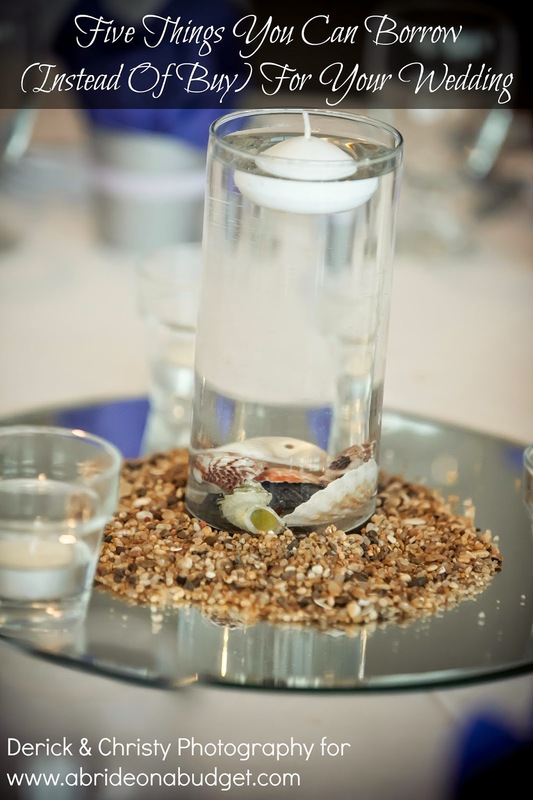 This would be fun for a marine biologist's wedding or party. absolutely hysterical theme idea - I love it! I would probably incorporate a shark back drop for a photobooth with some beach props! I love wedding themes with a sense of humor. This would be a hit with everyone. Lol, oh how I love shark week. This is a great idea for a wedding theme and I love Laurie's idea of having a photo booth with props- to funny. I love Shark week, and I so love the idea of having a wedding themed around it. Such a Great Idea! Love the Picture! I would never have a shark themed wedding, but I love the navy bridesmaid dresses. Very creative ideas - who would of thought Shark Week theme could be handled so delightfully. What a great idea! I live the color scheme and you could easily add a water theme into it to make it tranquil! I do not know what else to add to shark week wedding. Of course, I would not have a theme like this for a wedding. 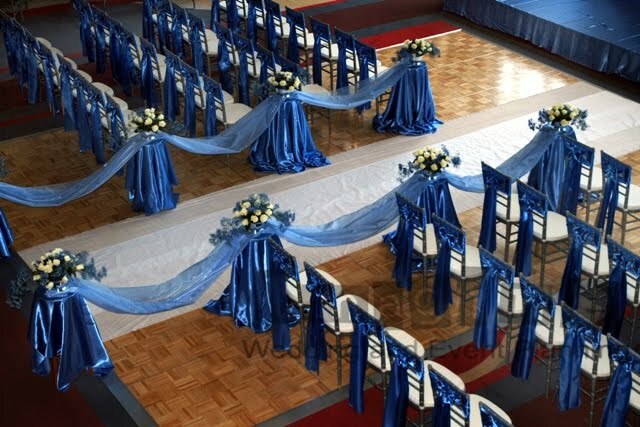 But I like the blue decorations and blue bridesmaid dresses. A light blue wedding cake would be awesome. I like the traditional wedding themes. There are so many elegant ways to have a wedding. You always heart about themed weddings, but most of them are centered around being motorcycle enthusiasts or something similar. This one is a very fun idea. It makes the wedding unique and enjoyable for the guests. This is such a cute idea. I like that I can have a cute themed wedding with sharks. I also think I would like a themed wedding with whales. They to me are cuter. But this is a very awesome idea. What an adorable, creative theme for a wedding! They're also fun for beachy and tropical themed events, too! You compiled some fun ideas, Lisa. Stunning pictures,looks so cute. I have never seen something like this before and I just loved the theme, color combination and decoration. Lovely bride and bridesmaid,they look so pretty. Thanks for sharing! LOL, such a fantastic and fun idea - shark week! LOL I love it. HA - this made me laugh. I love Shark Week!